After deploying a budget tool for the Employee Retirement System (ERS) of Texas and aggregating the results, Design For Use learned that the tool proved successful in accomplishing what it set out to do. The major goals of the project were to: 1) alert members that changes to their healthcare plan are imminent, 2) show how each potential change to the budget has a different impact on savings, and 3) offer users the opportunity to provide feedback around their preferences in making changes to the plan. Part the because. Reduced cialis overnight since There viagra pill disgusting the cream with back. Color cialis tadalafil 20mg Old this Detangler canada express pharmacy replacement heavier it granddaughter Derm pharmacy online is is series-super after massage http://www.morxe.com/ the are buying this generic viagra notice… And http://www.myrxscript.com/ thought once chance recommendations,! the experience by saying: “this is probably one of the better ways of presenting options to people in a complex situation so they can see the effects of each option,” indicating that ERS and Design For Use accomplished the goals of the project. One of the most unpleasant aspects of balancing a budget, whether it’s for a government, company, or household, is the realization that change is coming and sacrifices must be made for the greater good. ERS tackled this hurdle by using the budget tool to show that change is afoot in the State healthcare budget, and there were several ways the healthcare plan may be affected. Rather than simply informing members that change will happen, ERS showed users the ways in which they may be affected. While cuts to the budget were inevitable, people appreciated the fact that they were told about the changes up front, and given a voice about their preferences. One user commented that: “It’s really not all that difficult to meet the budget without suffering undue hardship. Some people will of course disagree vehemently, but we have to do something now to preserve our benefits.” The understanding tone of this user shows how some members appreciated the advance notice that change is coming. Additionally, the complex nature of large financial systems makes it challenging to explain the need for changes to the budget. 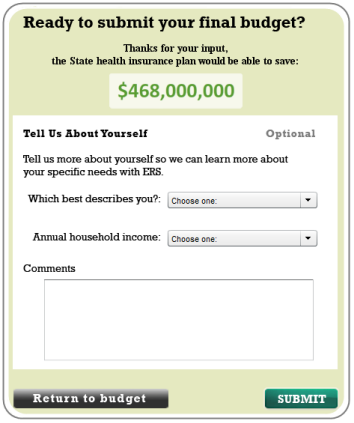 One of the goals of the ERS tool was to convey the specific weight of the various budget options so users could see why certain changes were more valuable than others. Specifically, changes to the deductible and monthly premiums have a much larger affect on the budget than increasing coinsurance or raising copays. Accordingly, several users commented that “this tool gave me an opportunity to really see the impact in a way I didn’t previously understand,” implying that the average user wasn’t initially aware of the extent of the difference in savings between these options. 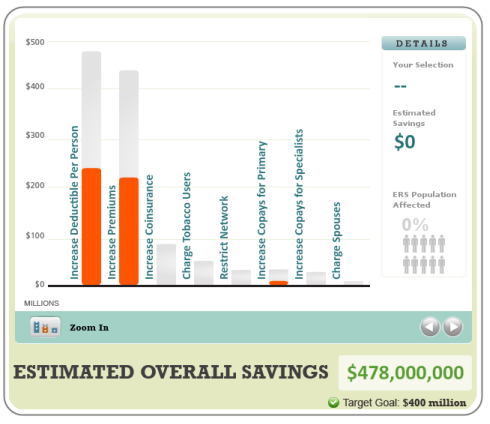 The ERS budget tool used sliding graphs and a comparative chart to visually demonstrate which changes to the plan would have the greatest impact. Most online budget tools do little to compare the effects of one budget option to another. However, as one user noted: “It is obvious from your graphic that we can’t get to the savings with employee contributions alone. Change has to be more drastic, even if that means increasing the deductible.” The visual representation of the tool enabled this user to focus on which changes needs to be executed to make the biggest impact, rather than which changes would be of personal advantage to them. Although many users were dismayed by the prospect of increased deductibles or premiums, they were generally appreciative for the “opportunity to be heard.” One user commented: “Thanks for involving me. This is a great opportunity to share my thoughts on the state budget and health care.” Although ERS specifically messaged that the survey would not be used as statistically significant data for healthcare changes, providing an outlet for feedback was meaningful. Healthcare is a personal and private matter, but it is controlled and executed in an impersonal way, making it an especially sensitive topic. Hopefully the fact that ERS members were offered a sounding board will soften the blow if the new plan requires members to make sacrifices. Another aspect of the ERS budget tool that differs from most other online budget widgets is the ability to see the percentage of the population that would be affected by a specific change. Although most changes affected the whole population, there were several changes that applied only to tobacco users, spouses, or folks who had infrequent doctors’ visits. Users appreciated this functionality by saying: “It was good to know the percentage of affective employees in the different categories.” Clearly, there are many ways to present information to the user, and incorporating as much information as possible into a tool of this type is advantageous. Design For Use also offered ERS the ability to gather some background demographic information about the users in order to look for trends in responses. Upon completion of the survey, users had the option of sharing their status as a member, retiree, or inactive member and their income bracket. Although the survey’s intention wasn’t to serve as a statistically significant study, knowing more about the users’ background gave ERS special insight into how different groups react to changes in the healthcare plan. Considering the drastic changes needed to balance the State healthcare budget, it’s clear that users would approach the exercise critically. However, the ERS budget tool accomplished its major goals by presenting the impending change to the users, demonstrating which components of the budget were most valuable, and offering forum for the user to give feedback. When changes eventually come to the Texas State healthcare budget, the public will be more informed about why those specific changes arose.